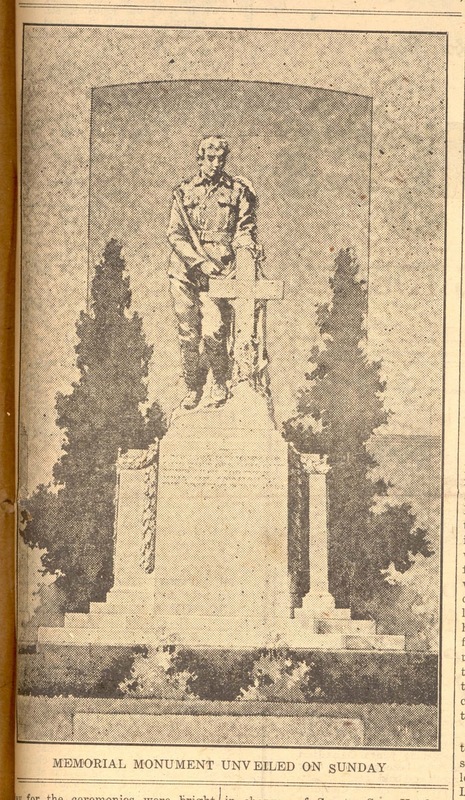 This Remembrance Day, the Lambton Room has chosen to highlight one of Lambton County's WWI memorials: the cenotaph in Petrolia's Victoria Park. 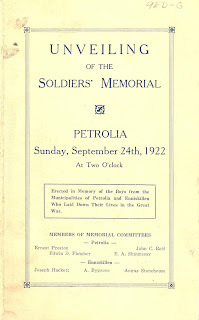 The cenotaph in Petrolia was unveiled on September 24, 1922. 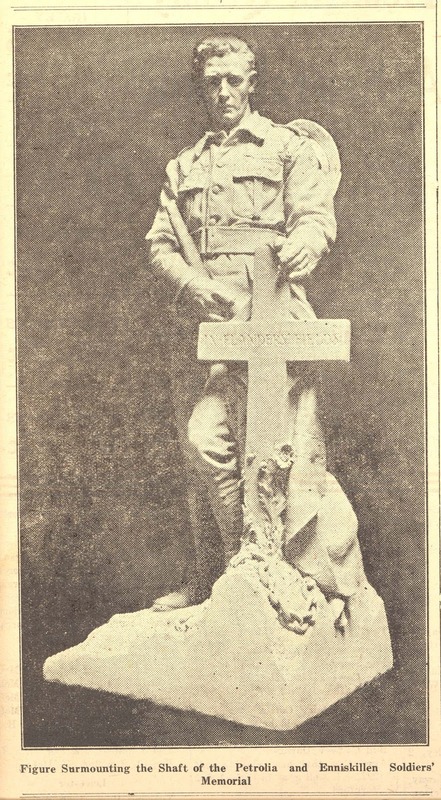 Designed by Toronto sculptor Emmanuel Hahn, it features symbolic detailing like the cross the figure is holding, the flag draped behind him and the poppies and chains at his feet. 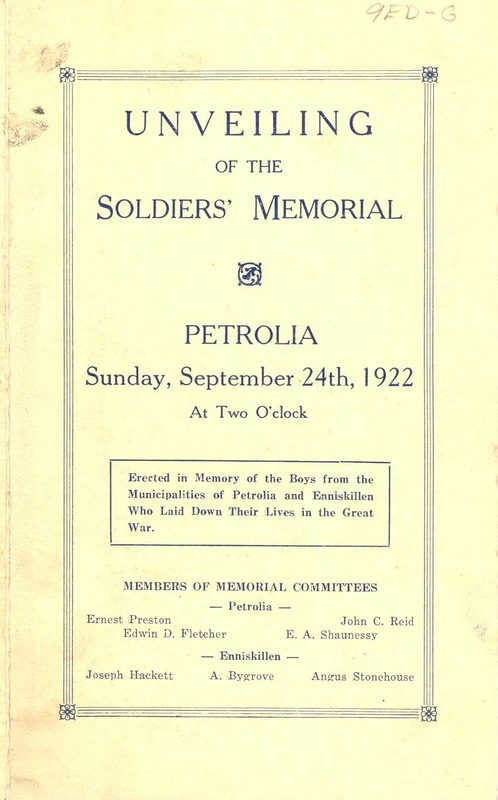 The ceremony to celebrate the unveiling began at 2pm, and the program issued to attendants read on the front cover: "Erected in Memory of the Boys from the Municipalities of Petrolia and Enniskillen Who Laid Down Their Lives in the Great War." 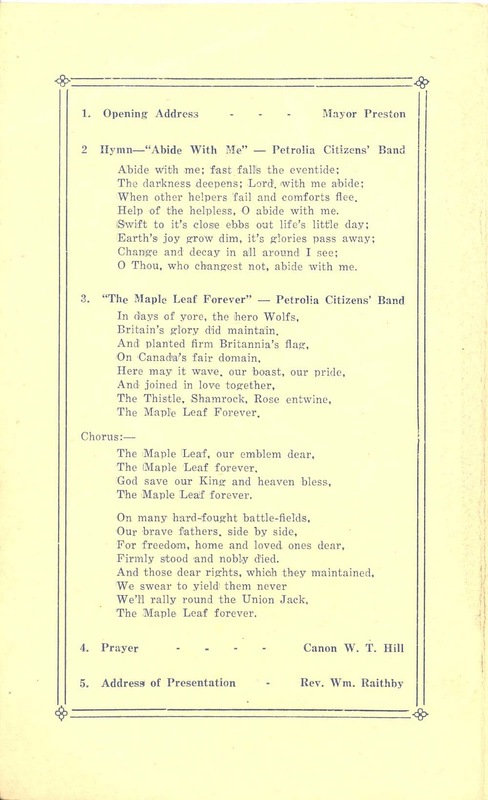 Hymns and patriotic songs were played by the Petrolia Citizen's Band; Mayor Preston gave the opening address; and the actual unveiling of the cenotaph (by Major Fairbank) was followed by a general salute. 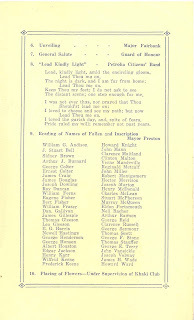 The Advertiser-Topic reported on September 28 that, while the day dawned brightly, "the mercury feel and a strong wind arose, which... did not prevent the gathering of an immense crowd" as citizens attended the important event. We are here to unveil and dedicate this memorial to those who, courageously enlisting, turning aside from life's prospects and enjoyments and daring to stem the tide of hate that threatened to engulf the world, passed by the way of death and did not return. 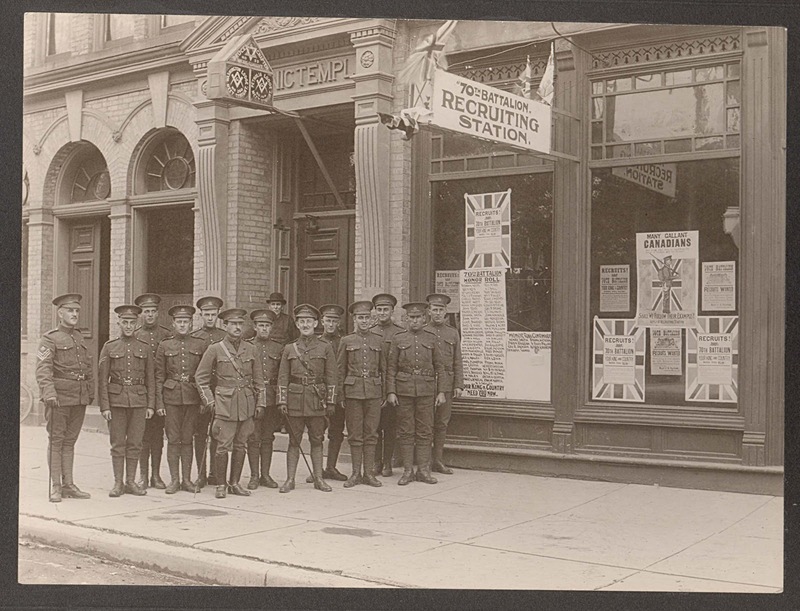 In 1916 Petrolia opened a recruiting station for the 70th Battalion. 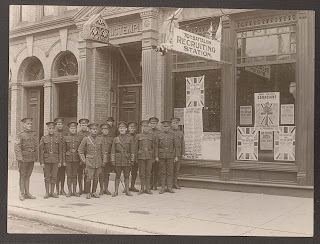 Featured below is a picture of recruits standing in front of the station. From left to right, their names are: Jack C. Reid, Clayton McRitchie, Verne Mandeville, -----, Leo Kelly, Major C.O. 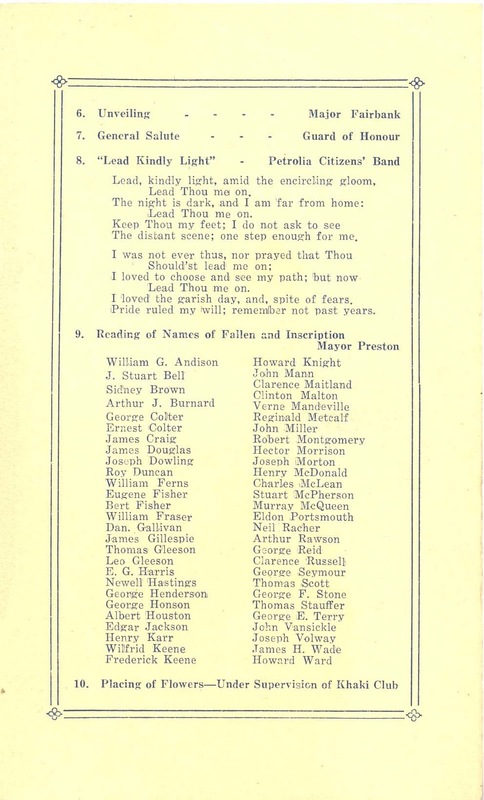 Fairbank, Smith (from Buffalo), Lt. Tom Murray, Bloss Scott, -----, Ross McRae, Bill Balls, and Murray McQueen. 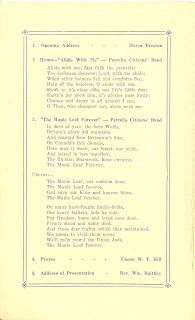 [the gentleman in the bowler in the background is Mr. Fisher, caretaker of the Masonic Temple]. 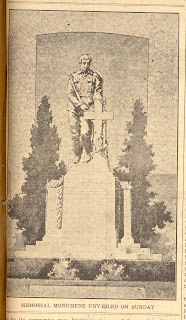 Two of those names are now listed on the Petrolia Cenotaph: Verne Mandeville and Murray McQueen never returned from the Great War. 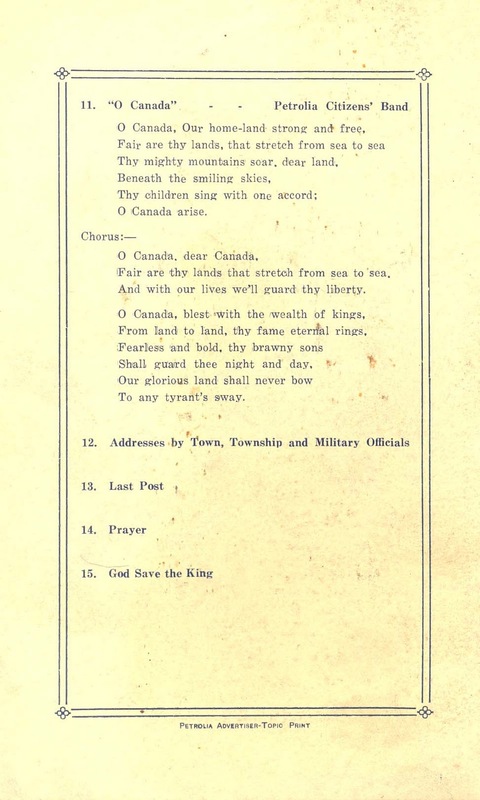 This Remembrance Day, take a moment to reflect on the men who were lost in the County of Lambton and across Canada. Thank you! 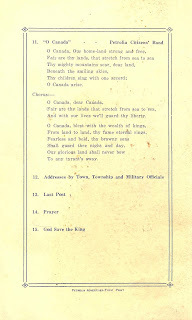 You've uploaded some great images of McQueen to the Canadian Virtual War Memorial. The Victory Medal is beautiful as well.